SUNBURY: AdOne Advertising and Design and Sunbury Community Hospital & Outpatient Center’s Women’s Imaging Department recently teamed up for a second time to present a check for $2,500 to the PA Breast Cancer Coalition. 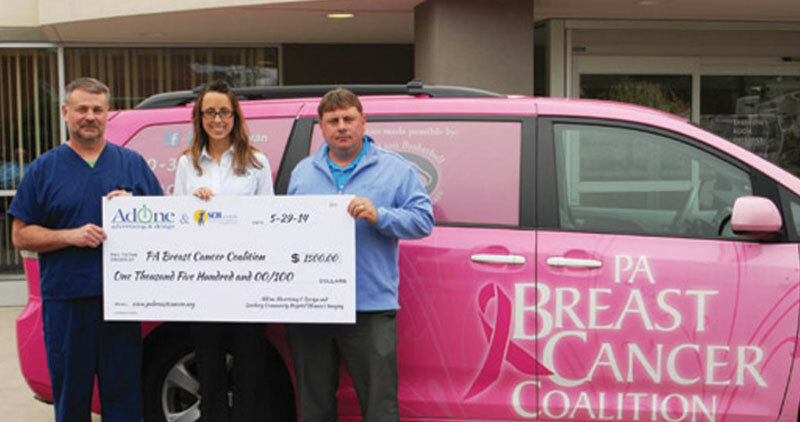 The money was the result of several area fundraisers and will help the PBCC reach out to thousands of women in PA diagnosed with breast cancer. The Coalition serves these women and their families through statewide educational programming, legislative advocacy and breast cancer research grants. In October, the hospital’s Women’s Imaging Department and Healthy Woman program hosted the First Annual Pink Ribbon event. The event was sponsored by AdOne Advertising, Foundation Radiology Group and The Packer House. The Pink Ribbon Event was a day of food, education and advocacy for the community. The program of events included a physician presentation on the importance of early detection of breast cancer, testimonials from breast cancer survivors, vendors, shopping and raffles. The event was held at The Packer House where a four-course brunch was served. AdOne also produced Breast Cancer Awareness can koozies and worked with various area restaurants and clubs in selling them with 100% of the proceeds going toward the overall donation. For more information about the PA Breast Cancer Coalition, please visit their web site at www.pabreastcancer.org.